Balancer shaft alignment tool – No.651589026300. Camshaft alignment tools – No.651589014000. Crankshaft pulley holding tool – No.651589004000 or 651589084000. Timing chain link installer – No.642589003300. Timing chain link installer die kit – No.651589046300. 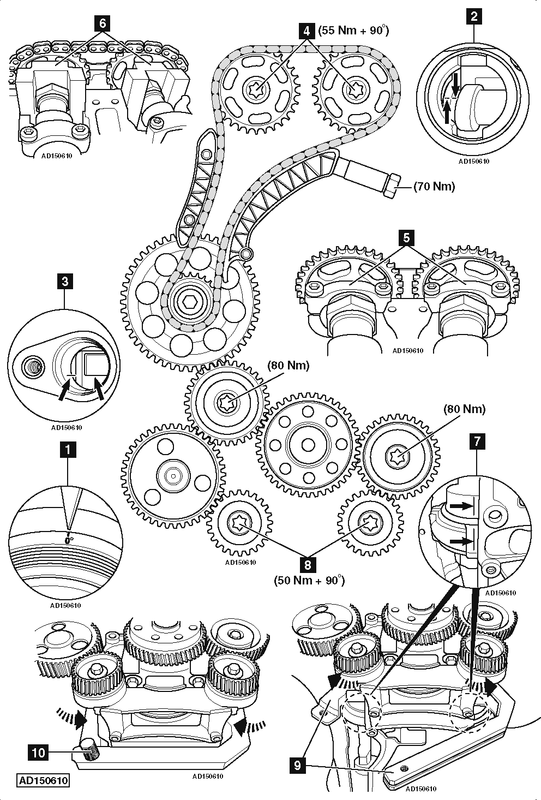 Timing chain to camshaft sprocket holder – No.651589034000. NOTE: Timing chain and gears located at rear of engine. Remove exhaust camshaft position (CMP) sensor. Ensure timing marks on camshafts aligned as shown  &  . If not, turn crankshaft 360°. Ensure crankshaft at TDC on No.1 cylinder  . Slacken bolt of each camshaft sprocket  . NOTE: Camshaft sprocket bolts have LH thread. Remove camshaft bearing caps  . Align camshafts with camshaft alignment tools  . Tighten bolt of each camshaft sprocket  . Tightening torque: 55 Nm + 90°. Remove camshaft alignment tools  . Install camshaft bearing caps  . Ensure balancer shaft timing mark aligned with balancer shaft housing timing mark  . Slacken bolt of each balancer shaft gear  . Rotate balancer shafts until balancer shaft alignment tool can be fitted  . Rotate balancer shafts until balancer shaft alignment tool pin can be installed  . Tighten bolt of each balancer shaft gear  . Tightening torque: 50 Nm + 90°. Remove balancer shaft alignment tool pin  . Turn crankshaft in direction of engine rotation to 30° ATDC on No.1 cylinder. Remove balancer shaft alignment tool  .